Made in 100% easy care polyester that is machine washable and requires minimum or no ironing. 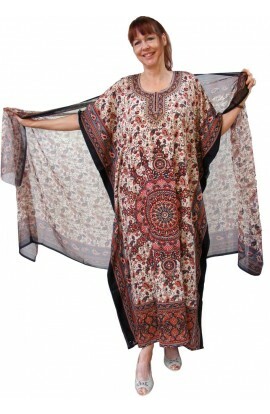 Plus size kaftan top that is free-sized and very loose-fitting, suitable for all sizes up to UK 28. Sizes smaller or larger are available as “bespoke” versions for people who prefer less or more looseness. Back length of this Kaftan Top is approximately 31”. Again, variations in length are also available as “bespoke” versions. Bespoke Terms for Returns apply.